Someone asked for a skincare routine tutorial on Youtube after my "Eating Food with Foodies on Friday" video is out on Youtube. After the video is published, I got few requests on how I do my everyday skincare. I did share once in Instagram Stories (@charlotteinwhite) but never have written about it. So I think it is time for me to reveal my "secrets"! First of all, Eating matters. Having a fruit smoothie in a market in Sydney. For more of the details of how eating could change your skin, I have shared in my book - LifeStyleInWhite《素系風格 — 素食與簡約生活練習》. For the below, I will share few of my everyday skincare steps with some of my recent pick of items. My skin type is a combination to dry & sensitive skin - 90% of the face is quite dry, but the nose usually gets oily and have blackheads problem. The blackheads problem has affected me since high school, and I have tried all the possible way to get rid of it, no matter it is scrubbing, squeezing or even removal pads... None of them really works and could sustain. But now I have found a balance, and here are some key products I would use to get the clean and clear skin. As I have mentioned, over 85% of my skin is quite dry, so a cream cleanser really works for me. It is a calcium and magnesium-rich mud with essential oil, and it cleans and detoxes the face at the same time it keeps the hydration. Perfect for sensitive and dry skin. I prefer using it in Autumn and Winter. For humid spring and hot summer days, I love to use a cleanser which feels lighter. This face wash formula is very mild, perfect for soothing the skin. What I love the most about is the fresh aroma of rose oil, every time I applied it on I instantly feel refreshed. Cannot stress enough how moisturizing your face matter, but it is just so important! And from time to time, my favourite differs - and here are some products I love recently. A good toner to spray on face is so important. To nourishes, hydrates, and protects the skin. This organic and gluten free mist have 6 natural ingredients - and I love rose flower oil to soothes my sensitive skin. Besides applying it on face after cleansing, I also love to spray it through out the day, it is just great for lifting my spirits by the refreshing touch and scent! This is simply a treasure. I found it when I was shopping in a pharmacy in Paris, and I instantly fall in love with it. Made with 100% natural ingredient of vine oil, this detox oil helps to 1)Detox your skin (a natural GLOWING skin in the morning! ); 2)Moisturize. Also, I read a lot of online reviews of this oil, and over 85% of them are positive from all over the world! In drier autumn and winter days, I need something which could keep more moisture. What I love about Lamer, is that their creme is super soft and moisturizing. Also they don't have a strong smell which I like a lot. Some of the skin care routine I will keep it as weekly basis. And they are such an important element in the skincare routine. What I love about this mask - it gently peels the dead skin cell - bringing the surface oil, dirt and pollutants away. And the process is so fun! First of all, I apply a think layer of gel on my cleaned face; after 2-3 minutes, it changes to thousands of bubbles (and you can actually feel it is really working! ); after 3-5 minutes, when I massage the bubbles away, there is some dead skin crumbles instantly. But be noticed that do not over do it, just once a week will be good. As it's name, it is an anti-pollution mask which not only exfoliating the dull skin cell away, but at the same time it stimulates revitalisation and moisturize the skin, best for drier months. There are so much pollutions in the city - a good cleansing mask is always my "to-go" item, I even bring it to travel! This lightweight gel mask, combined by calendula flower petals and aloe vera, instantly hydrated the face when applying it on the morning. I love putting it into the fridge, and apply it before putting make up on. Just 5 minutes, the skin will have a healthy appearance after the cooling and soothing process. I have been using it for 2-3 times a week for a year already! "Effortless" is not only a term applied to fashion styling, but also to skincare. 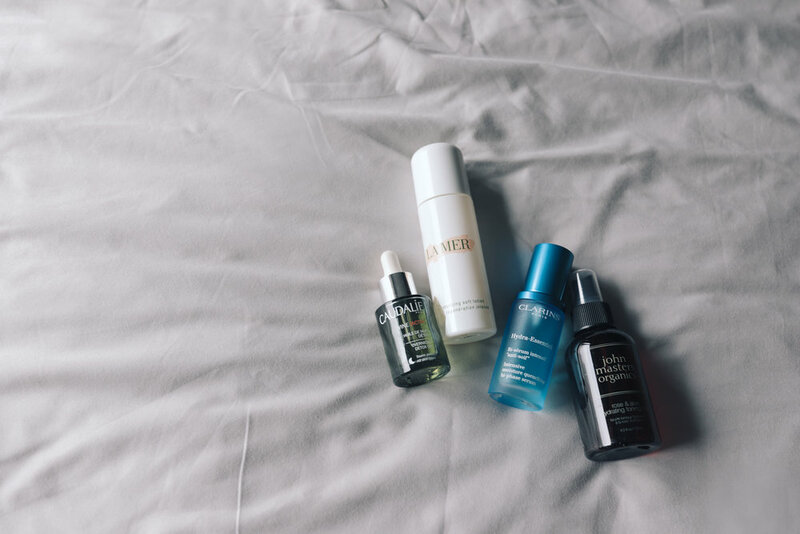 To look effortless doesn't mean I didn't do anything, but I tried to keep my skincare routine as simple and natural, together with a healthy diet and lifestyle. How about you? Tell me which step you think is the most important in the comment below!